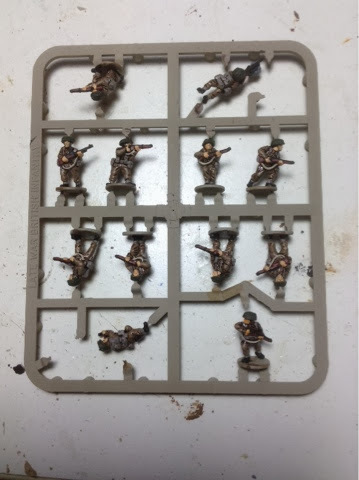 Plastic Soldier Company US infantry - finished ! Here is the front turret plate, rather poorly "drilled" out by removing the plate, drilling a small hole in the middle of the (blank) plate and widening it out by spinning a craft knife round in the hole. This allows the metal gun barrel I bought to be glued into the hole. The tracks - an Airfix-style loop of black soft rubber - are removed, which ended up breaking the drive and guide sprockets at each end of the wheel assembly, needing them to be glued back on. This is a pain, but you need the tracks off to spray them in Dunkelgelb, or to be precise, Army Painter Desert Yellow . I've been painting some of these chaps, and very nice they are too. This time it's an experiment in painting on the sprue. The base colour is an undercoat of Khaki spray from Halfords, which turned out very pale, so I added two washes of Windsor and Newton Peat Brown ink, and then did the straps in Faded Khaki from Coat d'Arms.